The oddly-shaped UAES Arialah (P6701), an offshore patrol vessel (OPV) of the United Arab Emirates Navy, has turned into one of the main centers of attraction at the ongoing IDEX 2017 arms show in Abu Dhabi. Looking nothing like any traditional warship on Earth, the Arialah is one of only two 6711-class OPVs being built for the UAE Critical Infrastructure and Coastal Protection Authority (CICPA), the UAE's equivalent of a Department of Homeland Security responsible for protecting the country's oil industry and serving as its coast guard. The reason for its oddly shaped hull is because the Arialah has what's called a "Sea Axe bow." The sea axe bow offers exceptionally low resistance to enable superior seakeeping, and sustained high speeds in high sea states, according to Damen Shipyards Group, the Dutch defense, shipbuilding, and engineering conglomerate that designed the Arialah. Damen developed the sea axe bow design in partnership with the University of Delft, the Royal Netherlands Navy, the U.S. Coast Guard and the Maritime Research Institute Netherlands. Besides the sea axe bow, other reasons for the Arialah's performance are its chined hull, active fin stabilizers and deep-V bottom. Damen has used its sea axe design for some of its oil field anchor-handling ships, standby and emergency rescue ships and large tugs. 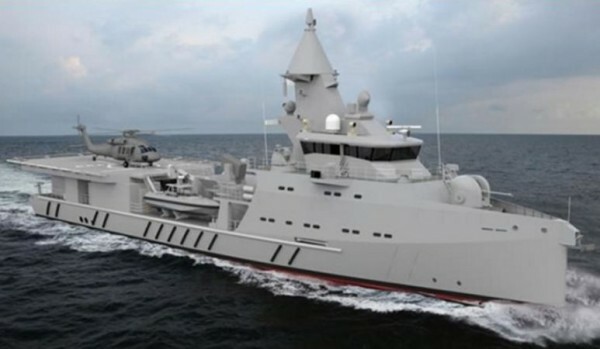 The 67 meter-long Arialah is armed with weapons and electronic systems more suited to a blue water navy warship than a littoral combat ship. The gun armament of Arialah consists of a BAE Bofors 57 mm gun in the bow and two OTO Melara MARLIN 30 mm autocannons. Other weapons consist of a a Raytheon Mark 49 Mod 2 Rolling Airframe Missile (RAM) launcher amidships and a Rheinmetall MASS Multi Ammunition Softkill System decoy system. Atop the pilot house is a fire control director, other sensors and a mast. The weapons are controlled by a Thales STIR fire control system and Thales Smart-S Mark 2 search radar, and managed by a TACTICOS combat management system. Arialah has a crew of 42 and berthing for up to 35 troops. She's powered by four MTU diesels, each connected directly to its own fixed-pitch propeller. Three Caterpillar diesel generators provide shipboard power. Twin rudders and two bow thrusters aid close-in navigation. Arialah has a top speed of more than 20 knots (37 km/h), and an endurance of 21 days.